Pumpkin Chocolate Chip Cookies are very appropriate this time of year, because it’s nice to have the combination of flavors of pumpkin, spice and chocolate, all in one bite. The cookies can be savored with a cup of coffee, a glass of cold milk or a warm cup of tea. Don’t hesitate for one moment to try a batch of my cookies this season, because they are exceptionally good. Soft, cakey and irresistibly tasty, I have a feeling that you won’t be able to eat just one of these sweet morsels. The spiciness of a rich pumpkin bread and the unmistakable flavor of a good chocolate chip cookie will have you making this recipe several times throughout the season. The only problem that I can think of is that the tender cookies stick to one another when transferred into cookie jars, but a few pieces of parchment paper between cookies will keep them from fastening onto one another. Whether you make your own pumpkin puree using those delicious sugar pumpkins from the farmers market or you use a good-quality canned pumpkin, make sure that your spices and baking soda are fresh. If you notice that your spices are off or are lacking in aroma, go to the store and restock these essentials. Yield: approximately 30 cookies, 3-1/2” in diameter. Equipment: 2” ice cream scoop, baking sheets, parchment paper or silpats. In a bowl, whisk to combine the all-purpose flour, baking soda, ground cinnamon, ground ginger, nutmeg and cloves. Set aside. In a large bowl add the melted butter, sea salt, light brown sugar and granulated sugar. 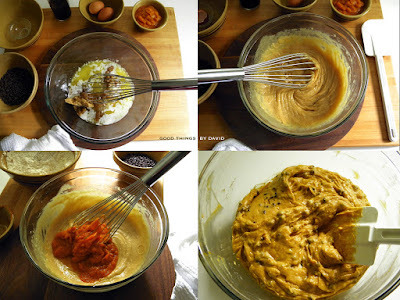 With a whisk, cream the ingredients for 1 minute, until the mixture is lightened and thick. Add the eggs one at a time, whisking to combine and emulsify the butter/sugar mixture. Add the vanilla extract and the pumpkin puree. Use a spatula to combine the ingredients. NOTE: the mixture will become grainy, but that is normal. Add all of the dry ingredients and semisweet mini chips. Combine with the spatula until all of the flour is absorbed into the dough. Let dough rest for 5 minutes before portioning. 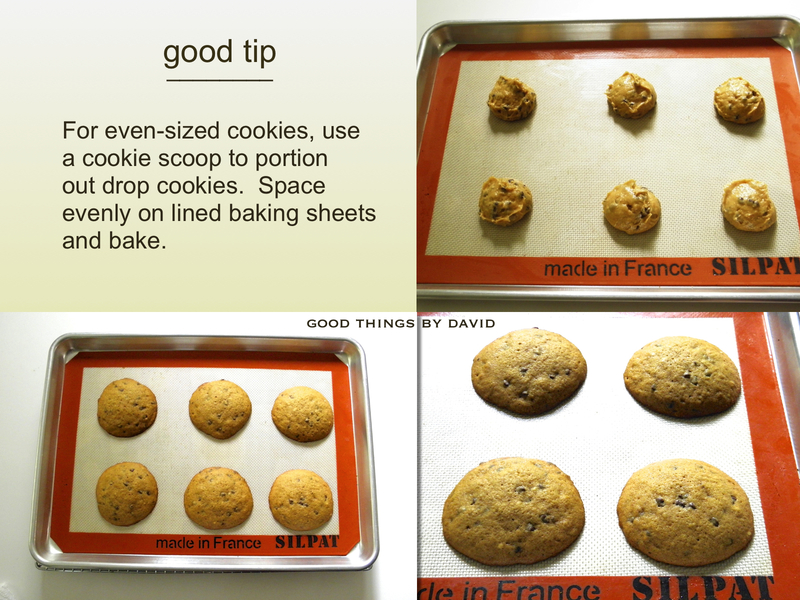 Using the 2” ice cream scoop, drop 6 cookie dough portions onto half-sheets, spacing 2” apart. Bake at 375° F (191°C) for approximately 11-13 minutes. One of my caramel cake stands by L.E. Smith Glass holds some cookies. The tea set is Wedgwood drabware. As I said, these cookies are soft and quite tender. 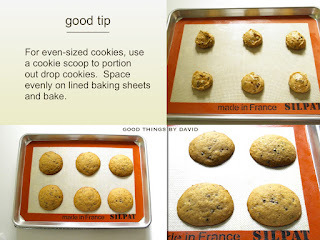 They are not crisp or chewy like most chocolate chip cookies, but nonetheless, they are extremely tempting. Lay out a baker's dozen on one of your cake stands if you are having company over for a relaxing weekend lunch, set out the teapots and teacups, and let guests take as many as they want. Be warned: you better have a tray of them nearby to replenish! With a few pantry basics you can easily whip up a batch of my Pumpkin Chocolate Chip Cookies for your family, coworkers and friends in no time at all. If you plan on packaging them up in boxes or cellophane bags for gift-giving, I strongly urge you to use cut-out parchment rounds or squares in between each cookie to keep them from sticking to one another. Either way, make sure you make several batches of this recipe. I think you're going to like this combination. Bon appetit!